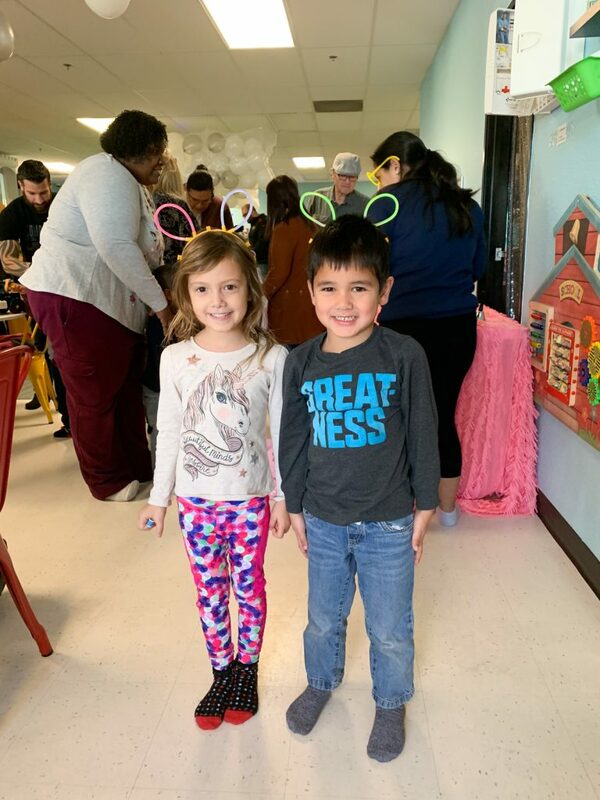 We had over 60 families come celebrate the new year with us over the weekend. 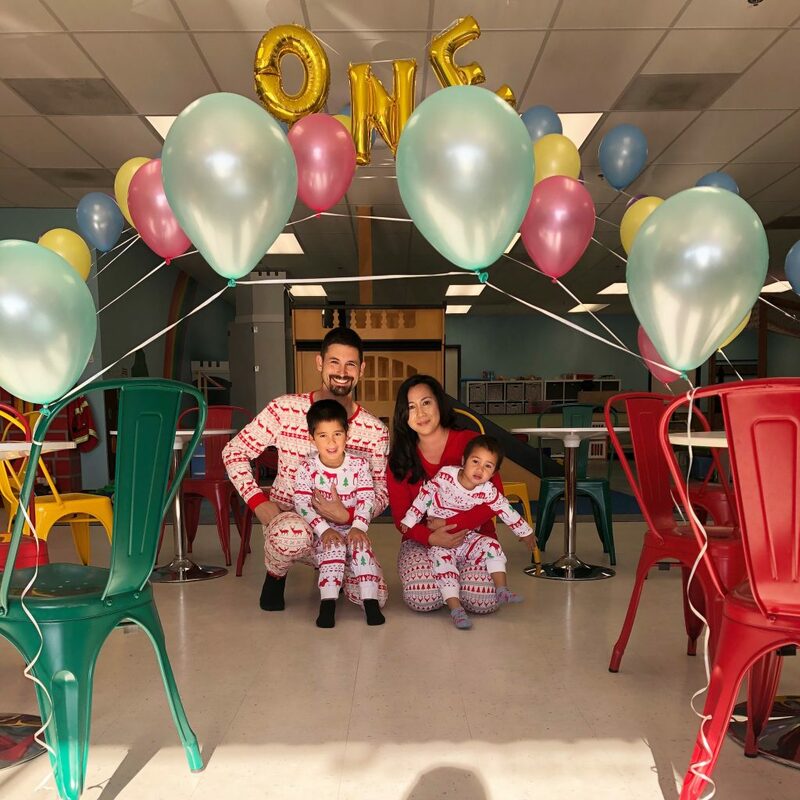 It was so fun to give the kids a chance to ring in 2019 in their way. 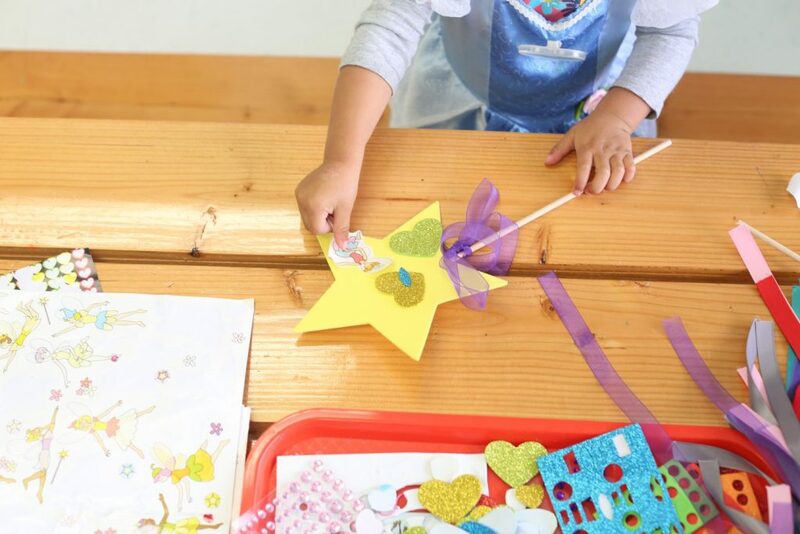 The day started with a noise maker craft. 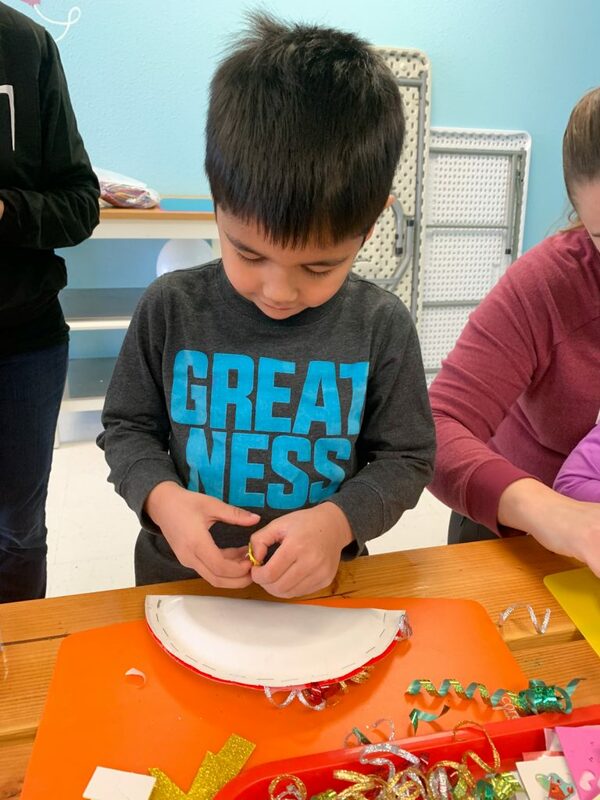 We stapled some beans in plates and they kids got to decorate them with stickers, gems and curly ribbon. 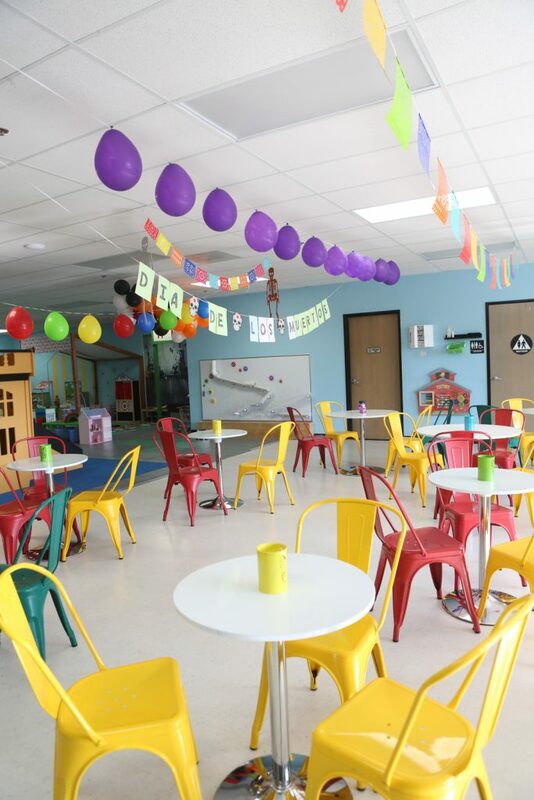 After, we let the kids play a spin game for prizes and enjoy a cookie and apple cider bar. You can see more of this on our video. Then we danced, danced and danced! 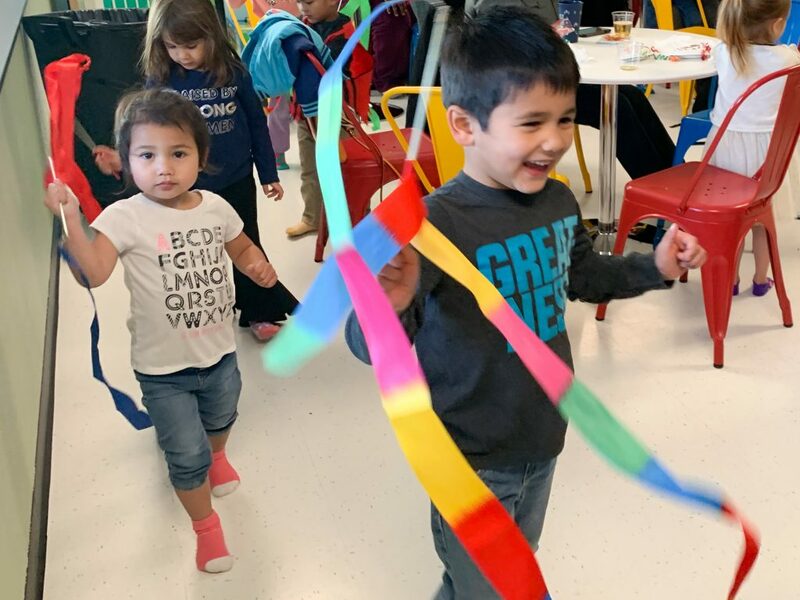 The kids joined in on some ribbon dancing, tambourine games, and freeze dancing, of course. The kids received glow toys and had one final game where they simulated fireworks by stomping on bubble wrap. It was one of our favorite activities! The grand finale was our balloon drop. We turned on some disco lights and did a countdown til noon! 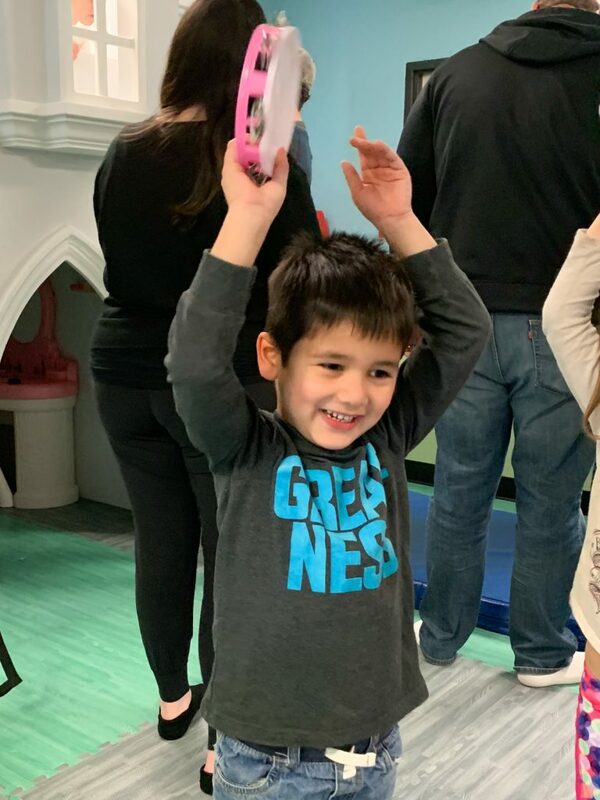 We had a blast and have to say it was one of our most enjoyed special events this year. Happy Holidays! 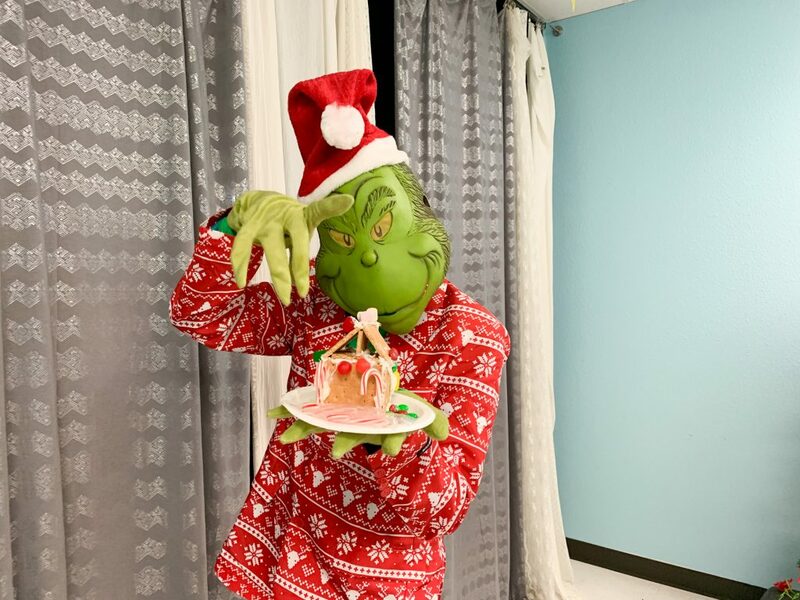 This year we celebrated the season with a Christmas Grinch Party. It was full of Christmas Hijinks! We started off with building Graham Cracker house, always a favorite holiday tradition with the kids favorite sweets. After, we gathered onto the floor for storytime. 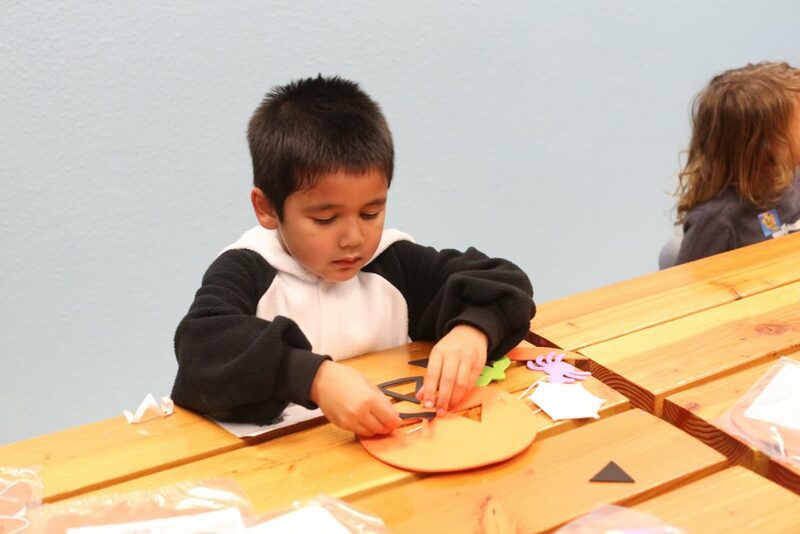 Interactive storytime is one of our favorites. 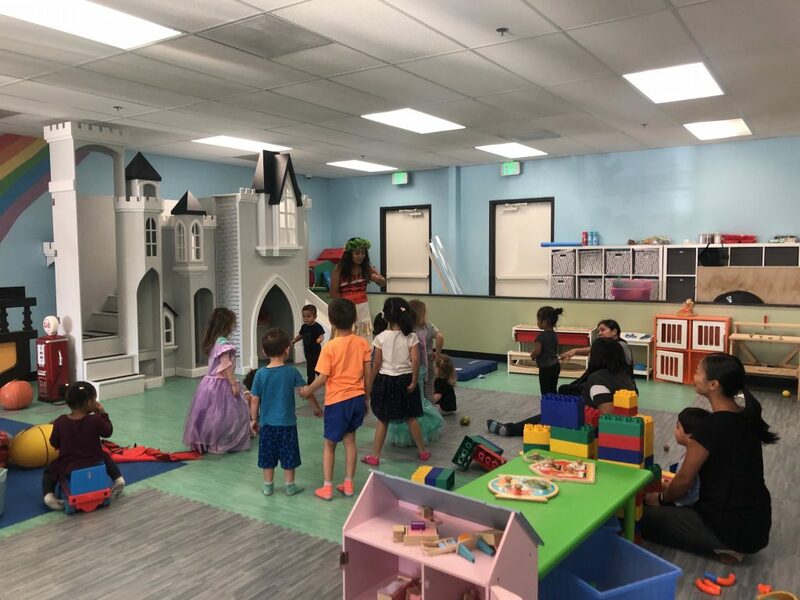 The staff loves acting out the stories, they are always funny and entertaining. 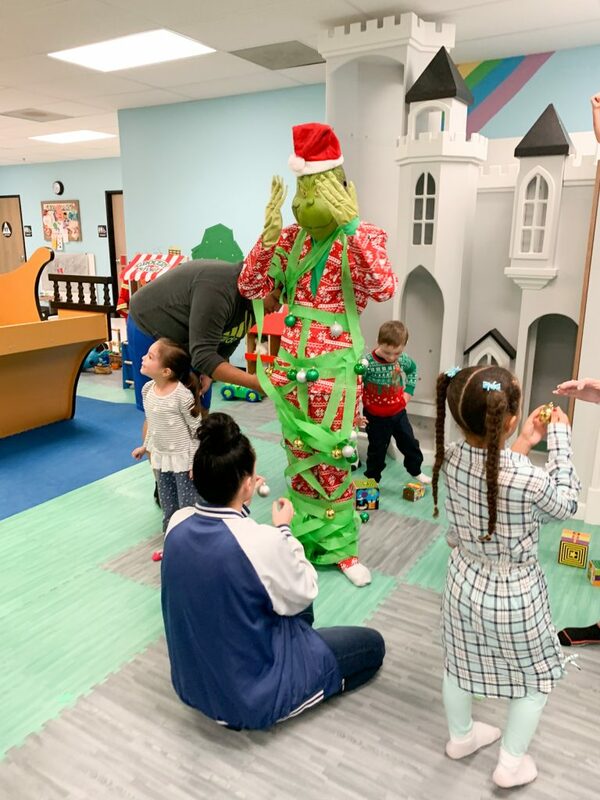 This story in particular included taping hearts to the grinch’s chest, tying him up with ribbon and a white christmas balloon drop. We also played several games which included decorating the grinch like a Christmas tree and a stealing ornaments off the tree game. You can see more of this game in our video. 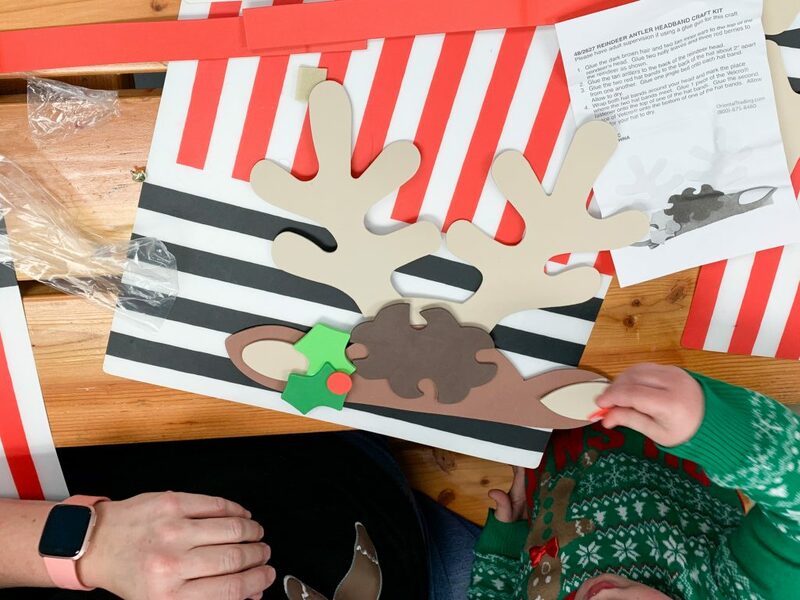 We ended the party with a Christmas craft, where the kids made antler headbands and then a round of Christmas bingo. This party was incredibly fun. We wish we could do more than one this year. Tune in the next year for another fun special event. Watch the video with all the hijinks below. 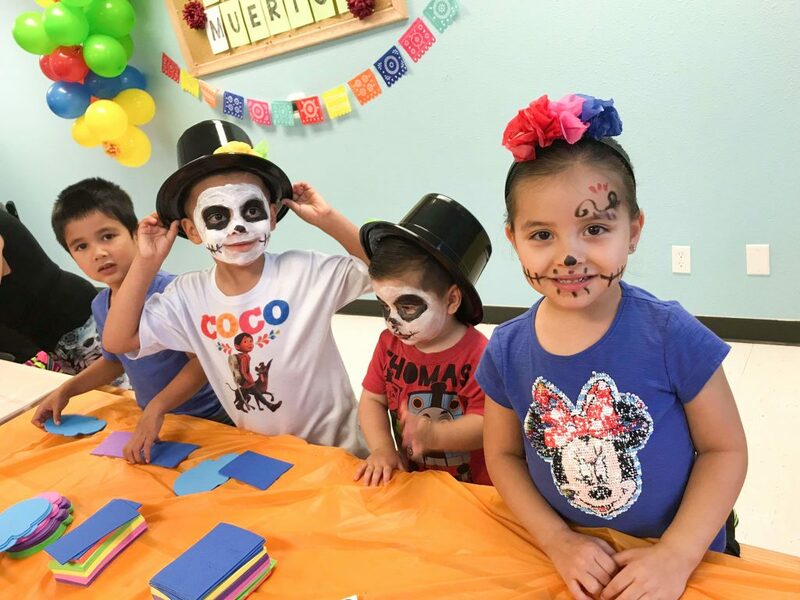 We celebrated Dia De Los Muertos the best way we knew how by doing crafts, dancing and singing songs inspired by the movie COCO. 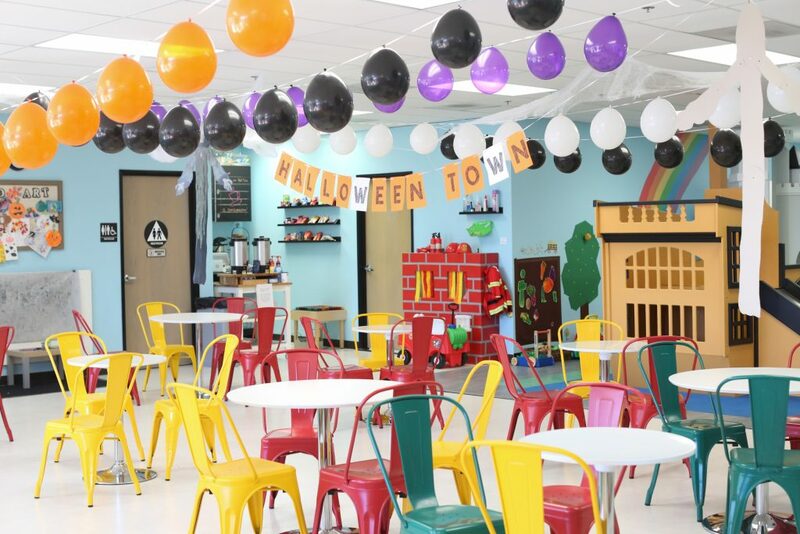 First, it was so much fun decorating for this event because of all the festive colors. 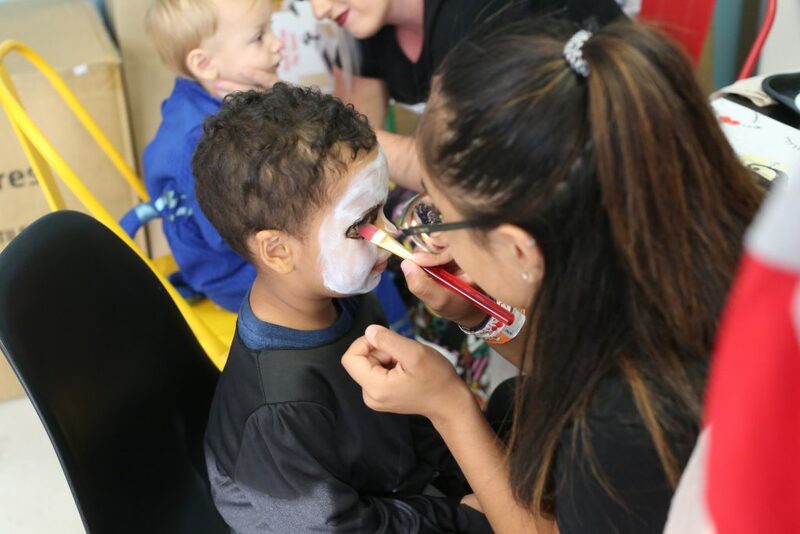 We also got in the festive spirit by painting our faces and dressing up as the characters from the movie. The kids got a choice to paint their faces too. All the kids got headbands or hats decorated with tissue paper flowers. Thanks JG for sharing this photo with US! 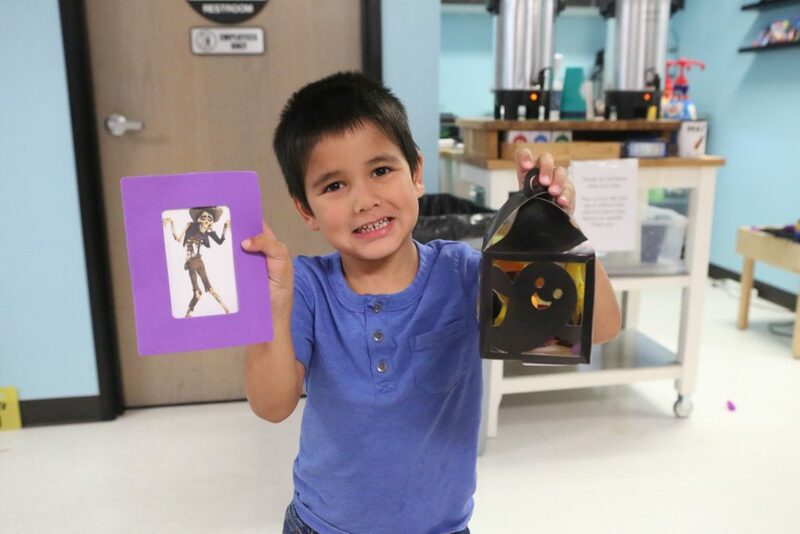 We did crafts, lots of crafts, including making lanterns and frames. We asked people to bring a photo of their loved one or the kids could use photos we printed from the movie. 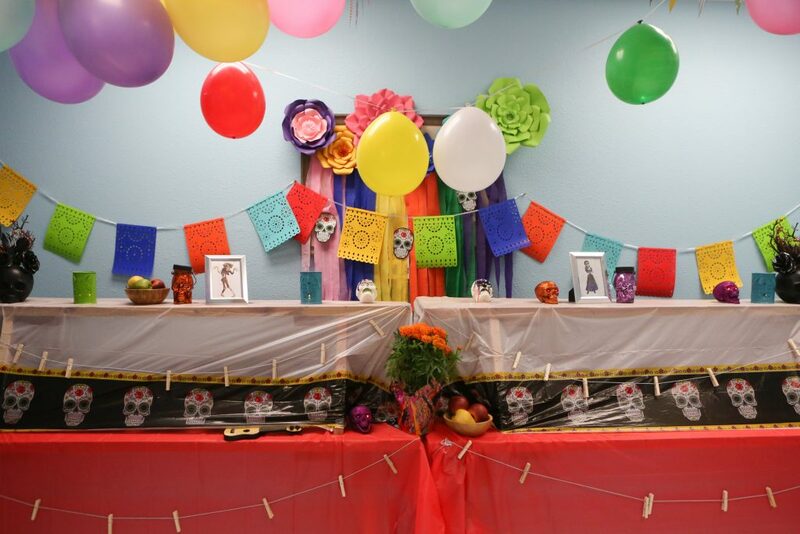 Afterwards, the kids were able to hang their frames on our ofrenda. And then then the festivities began. We sang a song from the movie, the kids learned a latin dance and we played a pass the guitar game. Here’s a short video of the all the fun the kids had. You can watch all our special event videos here and make sure to check our calendar for the next event. 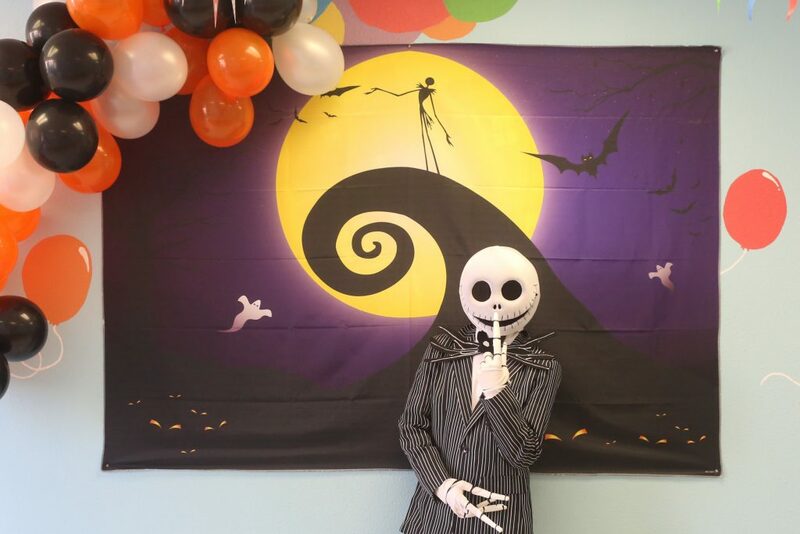 This year we’re excited to get a visit from the Pumpkin King! 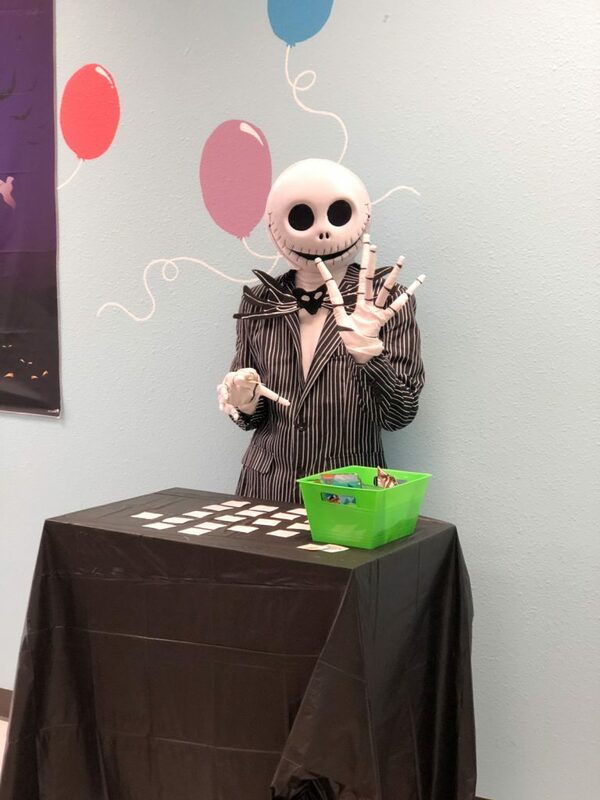 He brought all the spooky fun to our Halloween party and the trick or treaters loved seeing Halloween Town through his eyes. We started the party with some facepainting. The kids had a choice to do a full Jack face or something small like a pumpkin on their cheek. 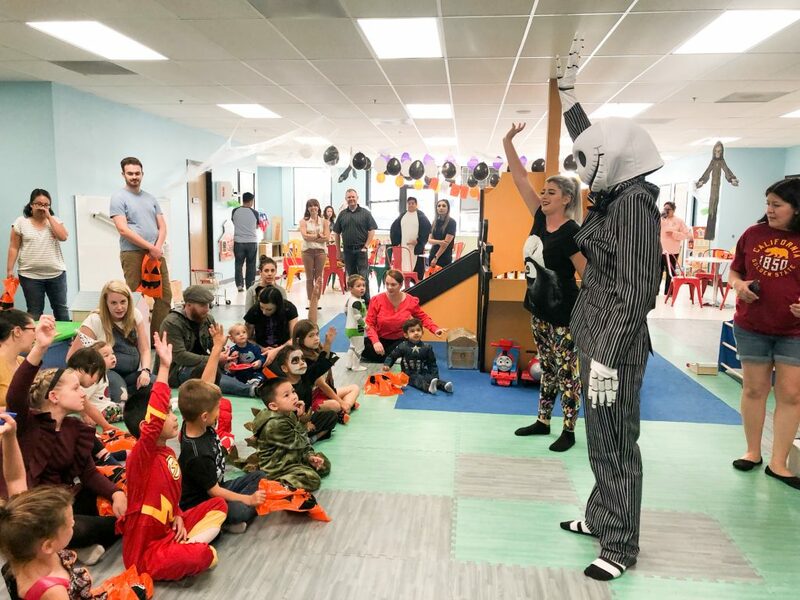 The Pumpkin King facilitated a spooky bingo game where the kids got to earn candy even if they didn’t get a bingo. 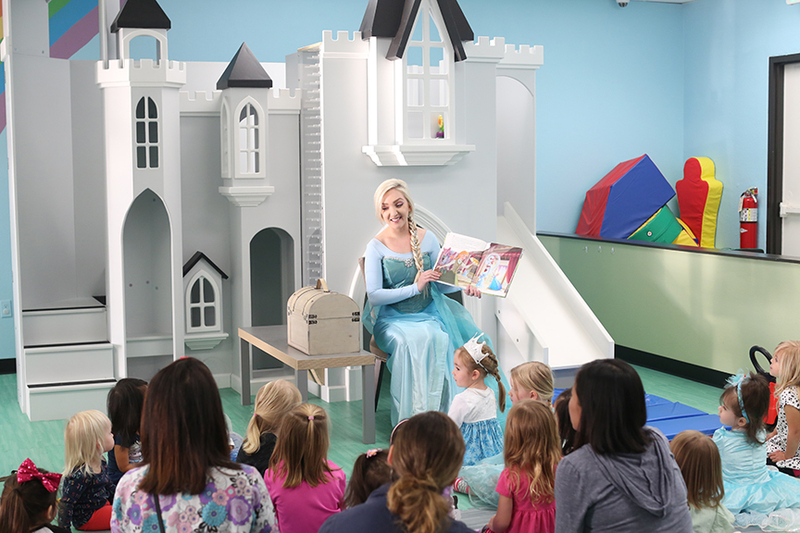 Our favorite time of the day was story time. Jack told us about how he found our about Christmas and his renewed for his favorite Holiday. It even ended with a snowfall. Jack played several games with the kids including our most beloved game of Freeze Dance. 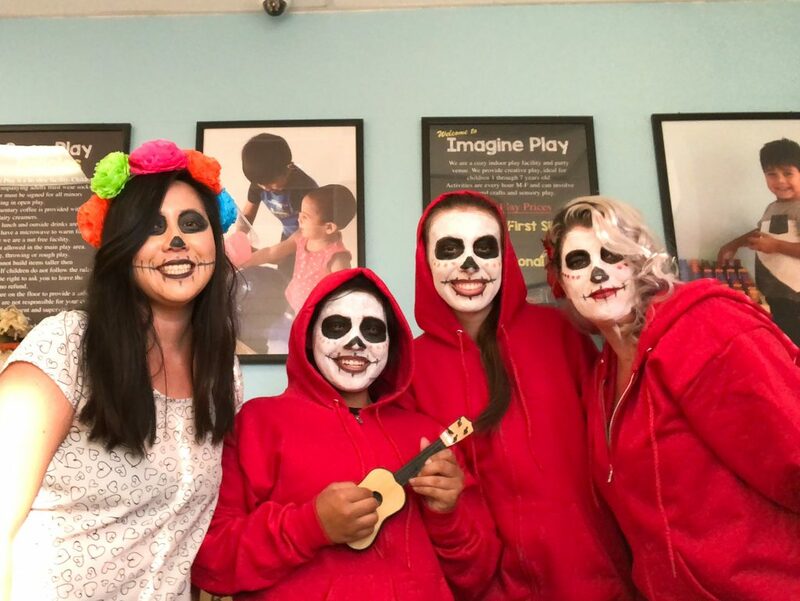 We made it more Halloween Party worthy by asking the kids to dance like zombies or monsters. The grand attraction was the pumpkin hunt! 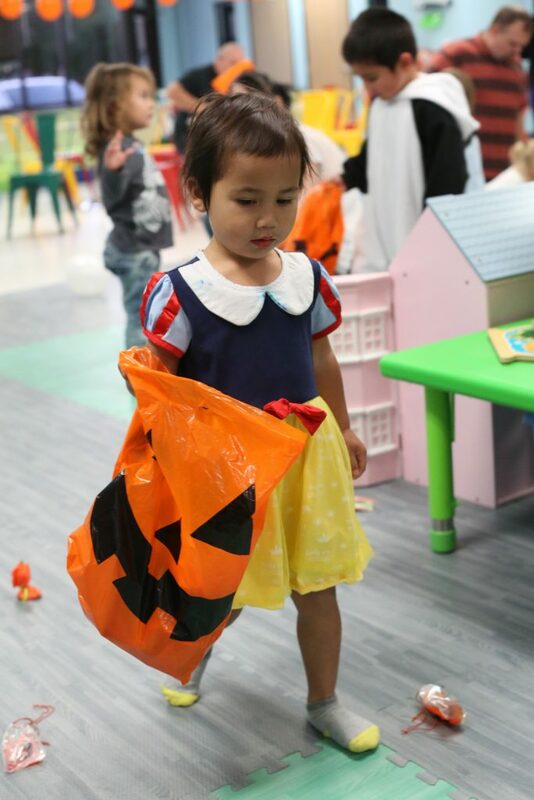 The kids got to fill their bags with pumpkins that contained candy, treat and tricks. 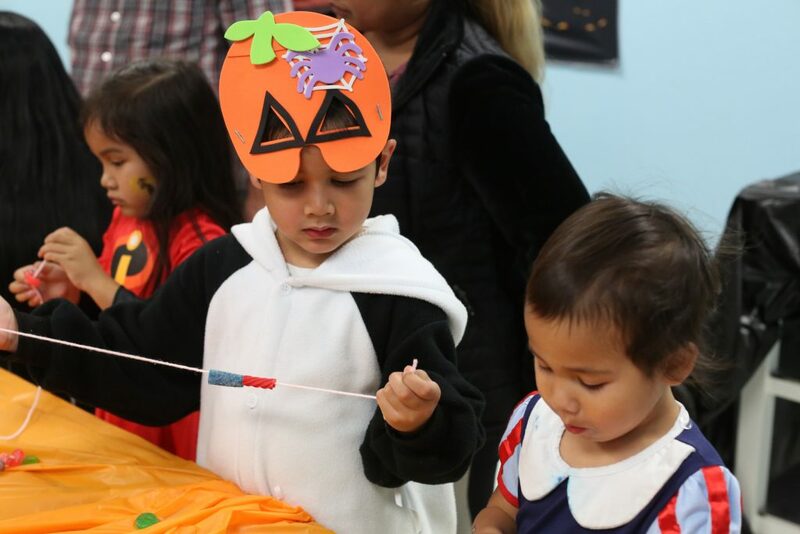 They really loved discovering the treasures inside their pumpkins. 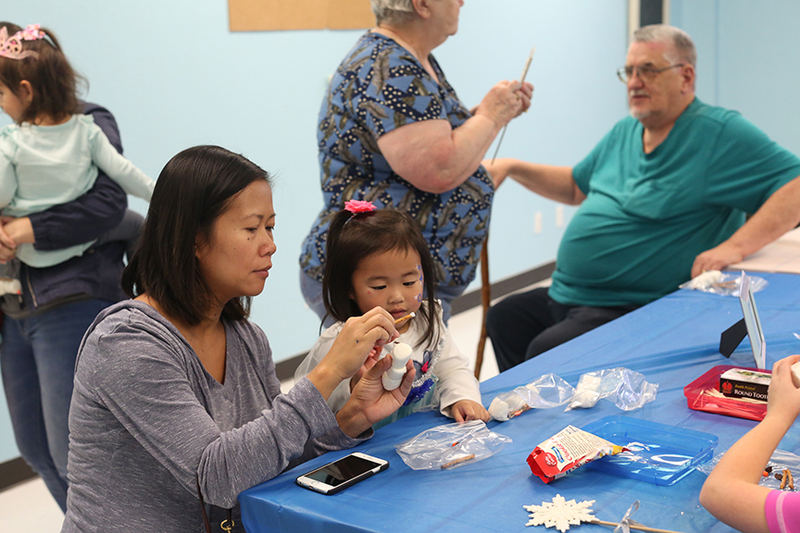 Finally, we ended with some crafts. Foam mask were available and the kids got to choose which masks to decorate. One final candy filled activity was necklace making. They could string their necklace with gummies, pretzels, foot loops, mints and more. It was fun to make, wear and eat! 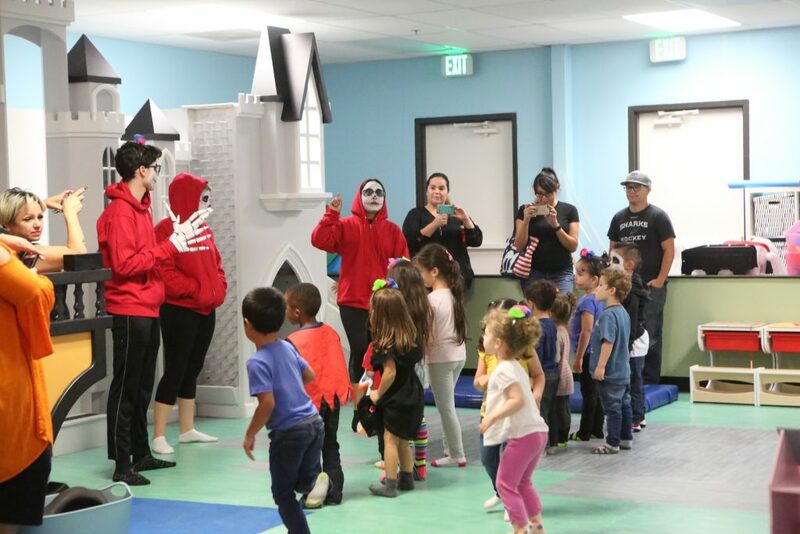 We had fun traveling to Halloween Town for a few days. It’s one of our favorite times of the year! Join us for our next special event, you can purchase tickets online. 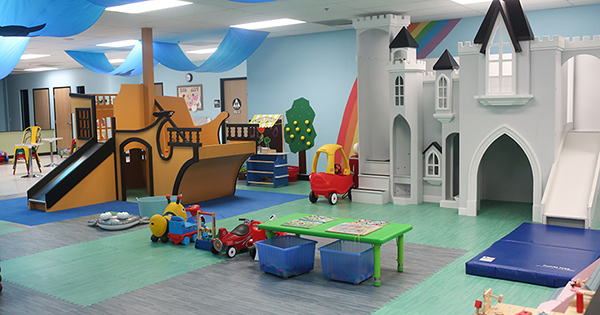 Imagine Play turns ONE this week! We can’t believe it’s been a over 365 days since our doors opened. We survived so many challenges this year, but we made it! Our first year hurdles included pricing changes and continuously adding onto our policies. The kids surprise and challenge us with their creative playing everyday. 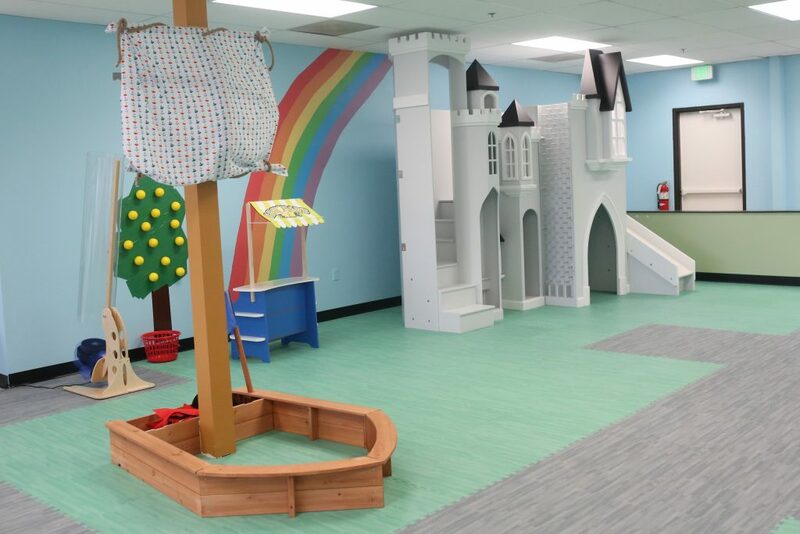 The play area also has made major transformations. We have added many new toys since October of last year and we continue to add every month. It’s been a learning experience for sure and although there has been some low moments it was still an amazing year nonetheless. We are so grateful for our community and all the friendly faces we have grown to love. 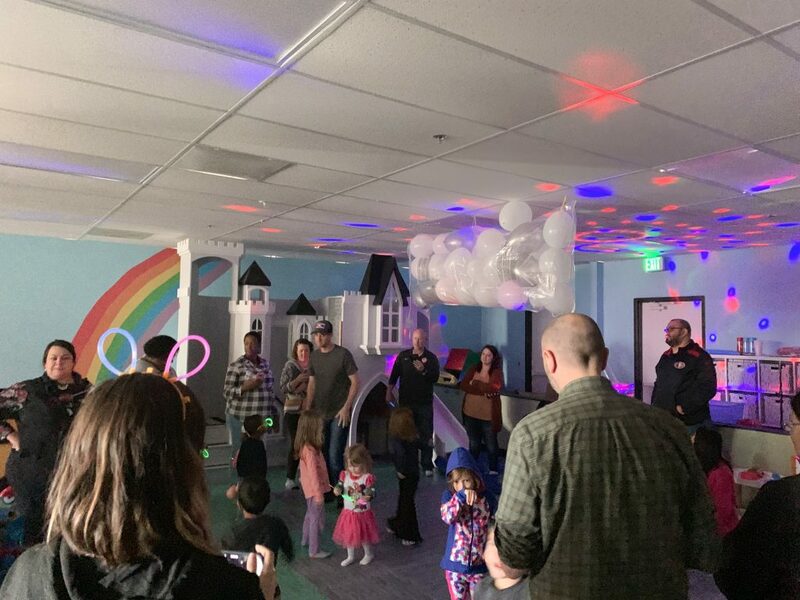 We hosted a couple of parties to celebrate our birthday this year. They were so much fun! Of course, our cupcake rainbow party was too cute! 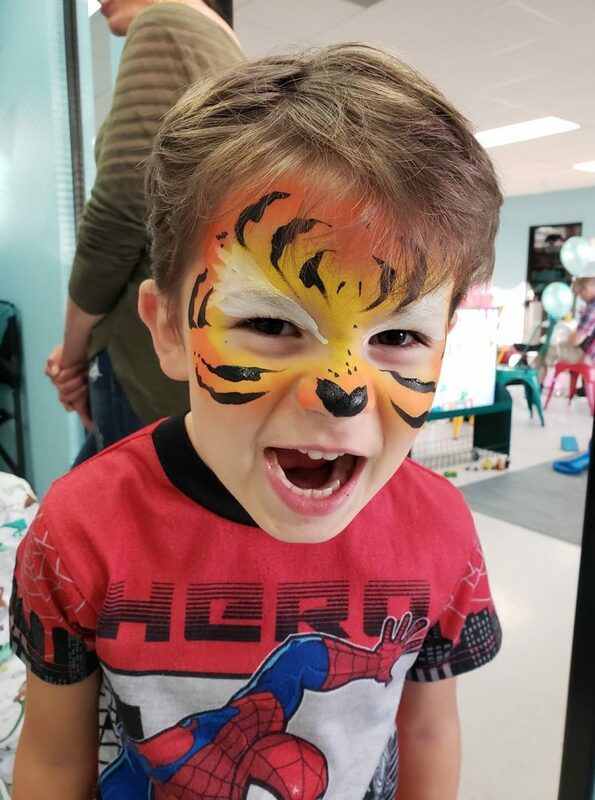 The kids got their face painted, animal balloons and so much more. We did a recap of all the fun special events in replacement to our hourly activities. 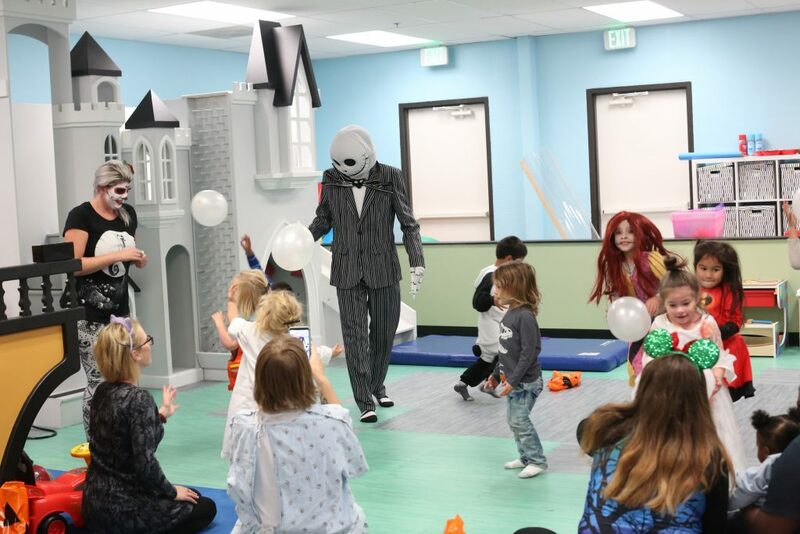 The kids loved meeting all the characters. 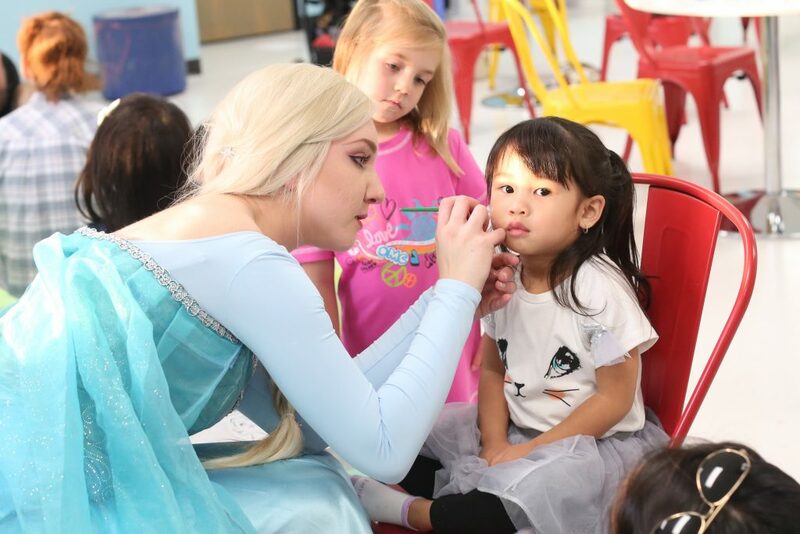 We started with airplane making with Skye and continued with story time with our Ice Princess. The day later continued with a visit from Belle and ended with a Hula with Moana and a visit from Catboy. Here’s a short video of all the birthday fun we had. 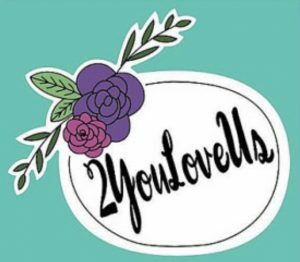 ….and we answer all your questions including what’s to come in our 2nd year in our 1st year update video below. 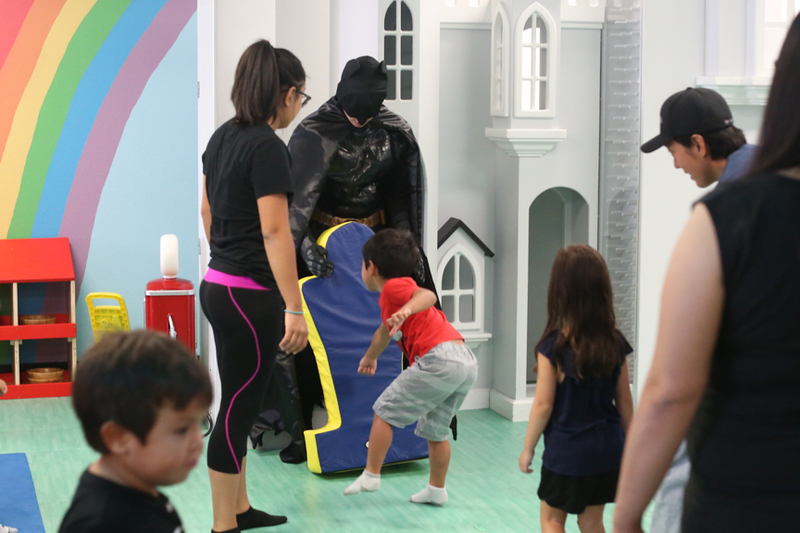 We celebrated Labor Day at Imagine Play with an epic superhero donut party with a visit from Batman. 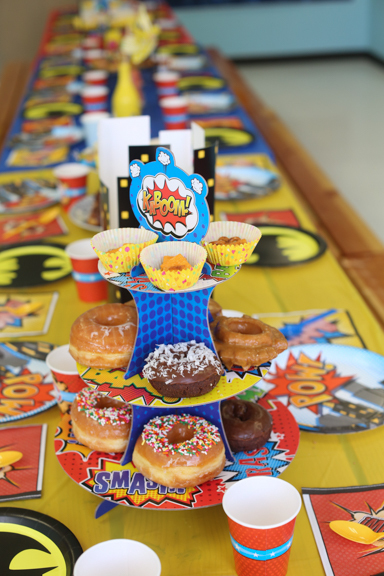 We welcomed our superheroes into a colorful party room, where they enjoyed donuts of every variety and other breakfast items. We love these stand with superhero graphics. They were the perfect vessel to hold our fluffy treats. We decided to keep the colors in the classic yellow, blue and red superhero scheme. 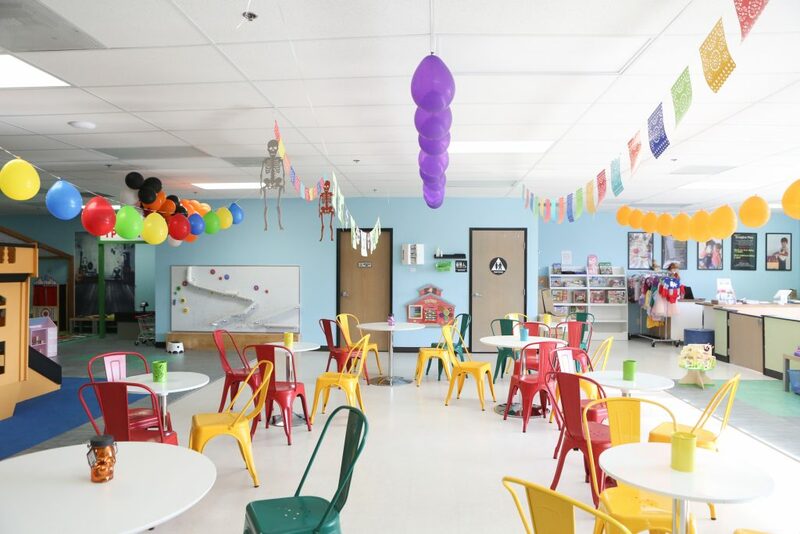 The vibrant colors made this party room festive. 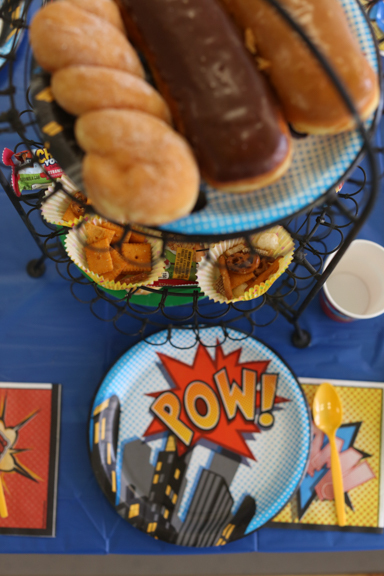 Each child place setting included a crime fighting plate and cup. We alternated between graphic plates and Batman. 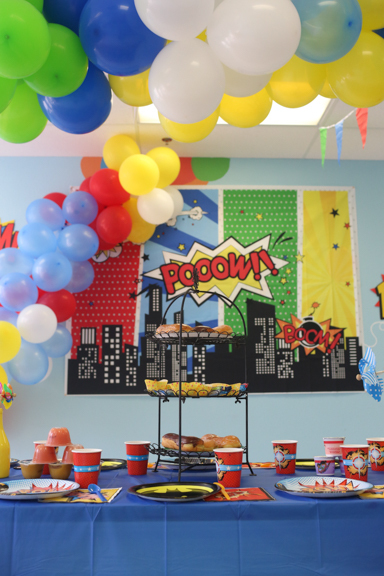 Some of our favorite details are the superhero backdrops. 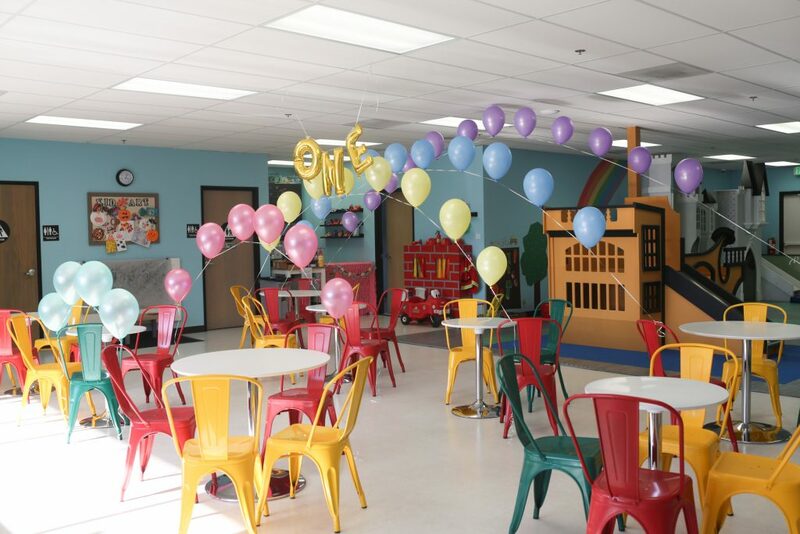 We had a total of three balloon arches for this party. We love how the arches bring life to any room. 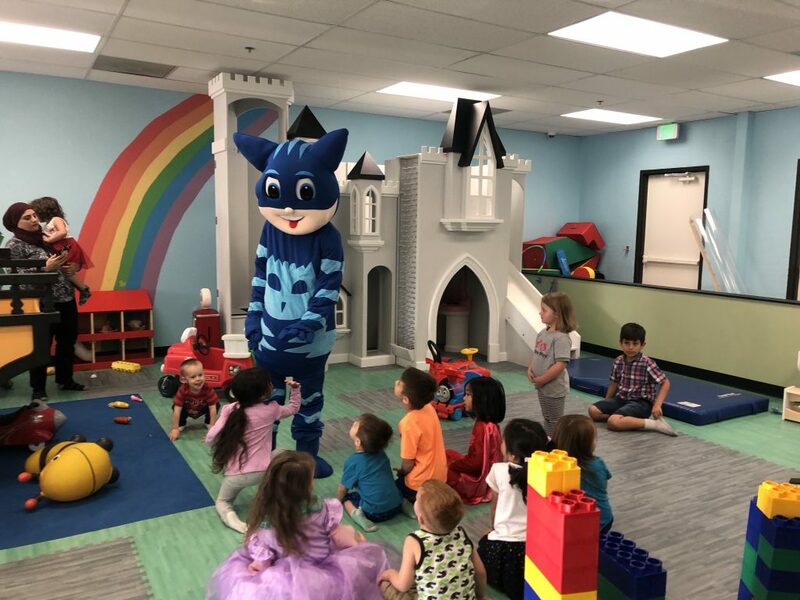 After breakfast, Batman taught the kids about how to spot a bad guy and what it takes to be a superhero. 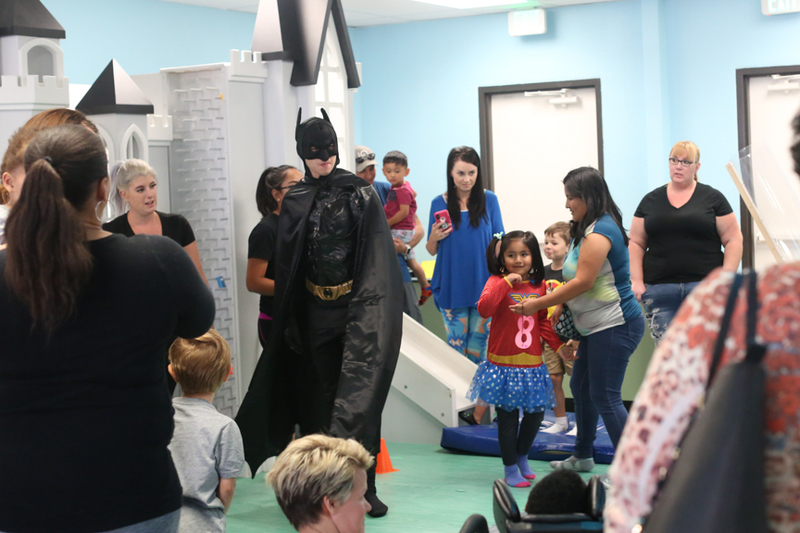 Our favorite moment during the Batman party today was when Batman was like “do you know how to spot a bad guy?” Pause. “They are always robbing banks.” 😂Batman is a funny guy! We also did some superhero training. The kids exercised to learn to be fast and strong and practiced some superhero moves. 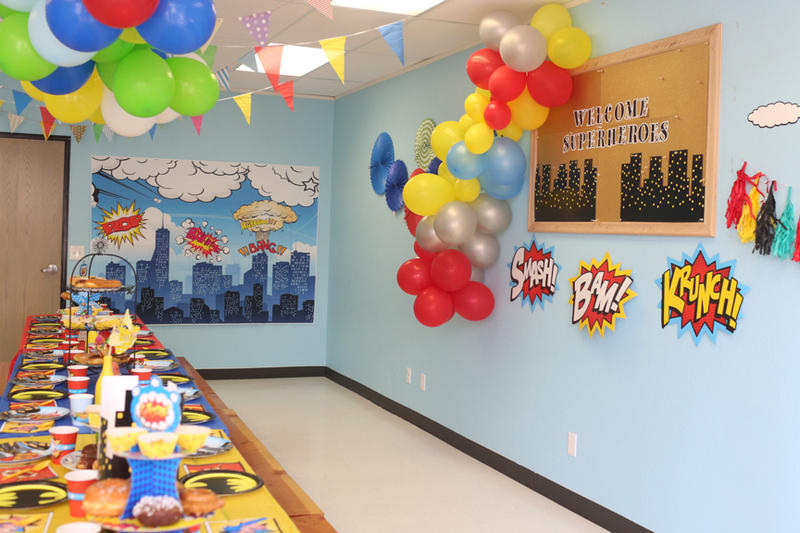 We can’t wait to hold our next superhero party. Join us for future special events. Register on our our store. 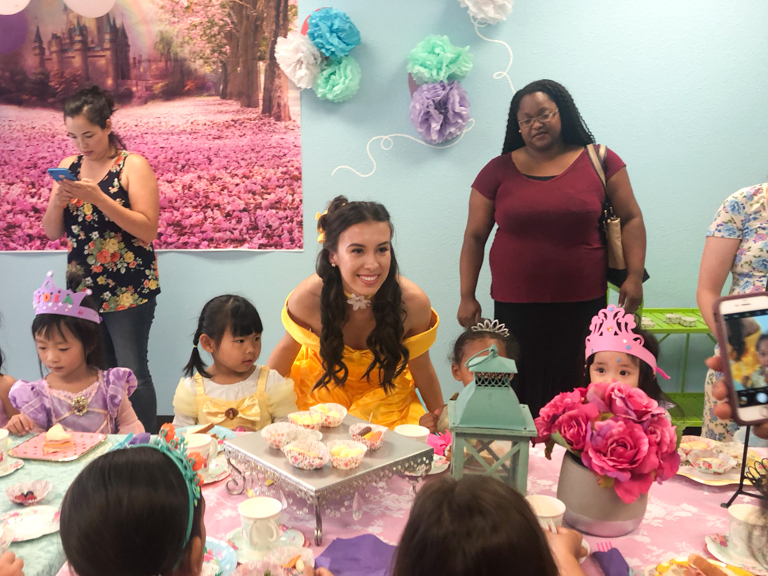 We had a blast at our Royal Tea Party with Belle and Moana. 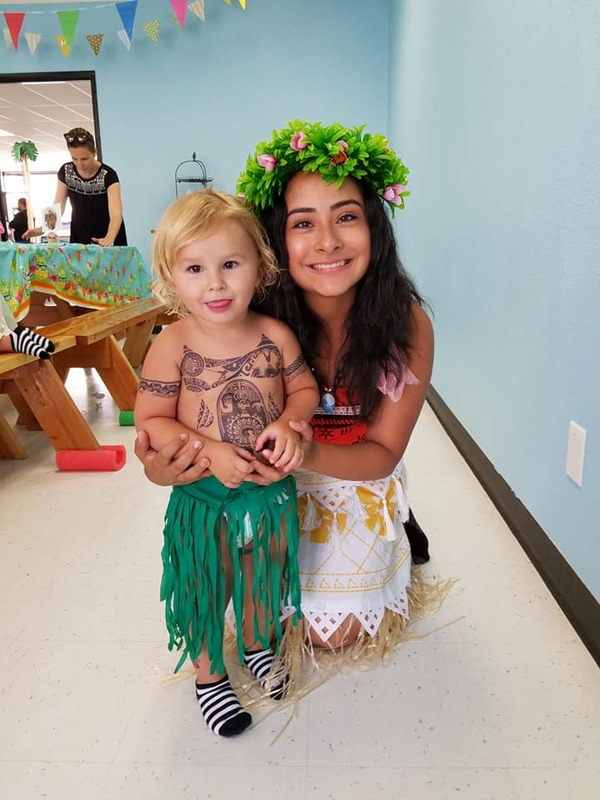 If you have come to our Moana event, you know how awesome she is. This is our visit from Belle and WOW she was amazing! 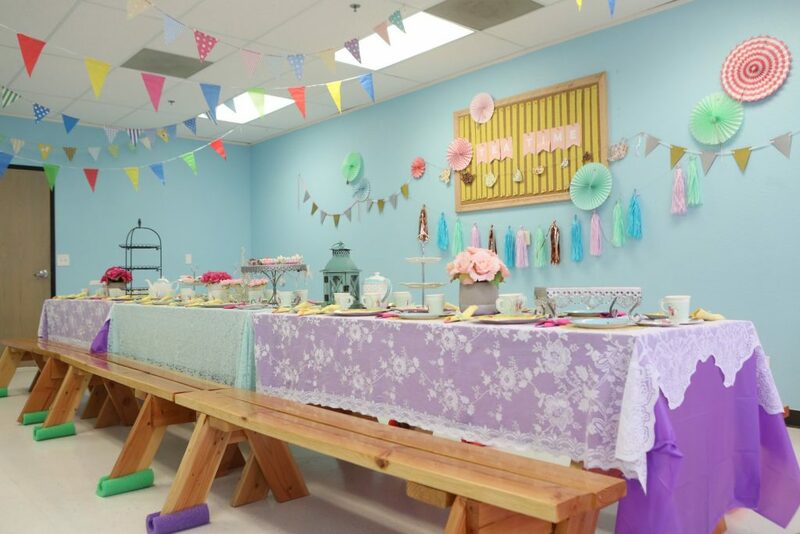 As always the tea party decorations turned out so cute! 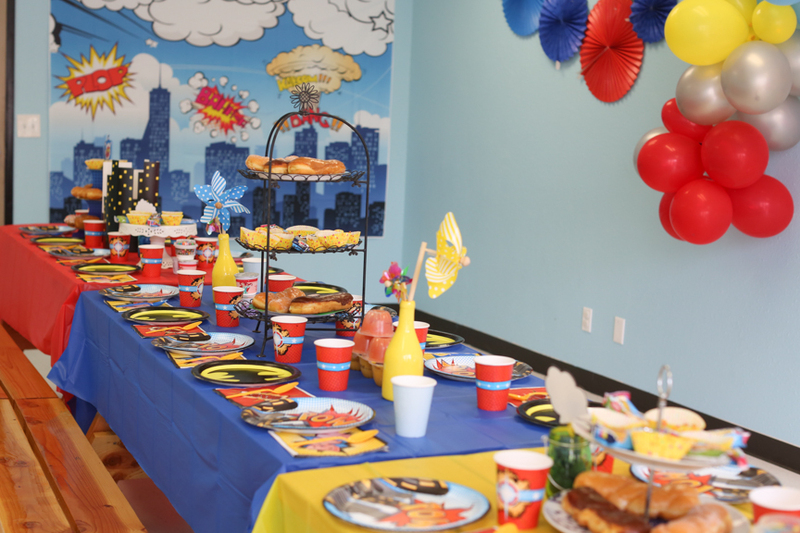 Without a doubt, one of our favorite party themes to put together. We’re also a little bit obsessed with the balloon arch, epic background combo! Major heart emojis and the balloon arch can be made to match many different themes, which we love! 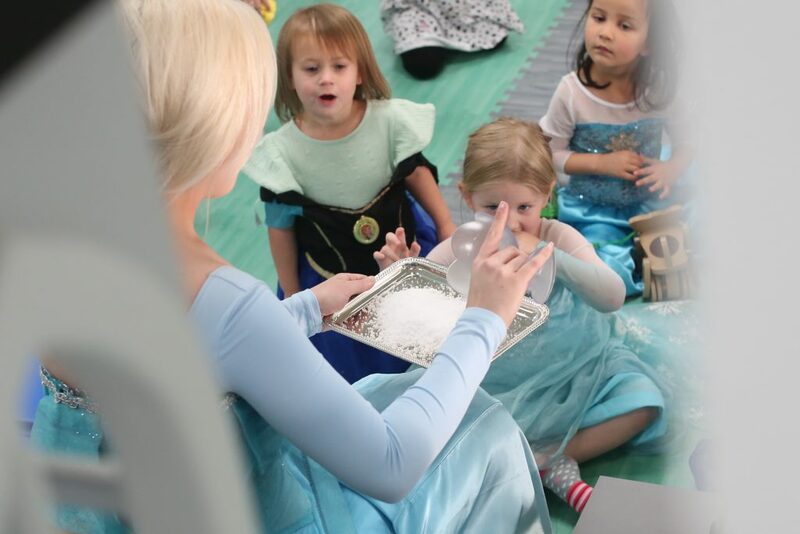 Just like our last princess party we served sandwiches and all of the kiddos favorite snacks such as puffs, cheese crackers and berries. 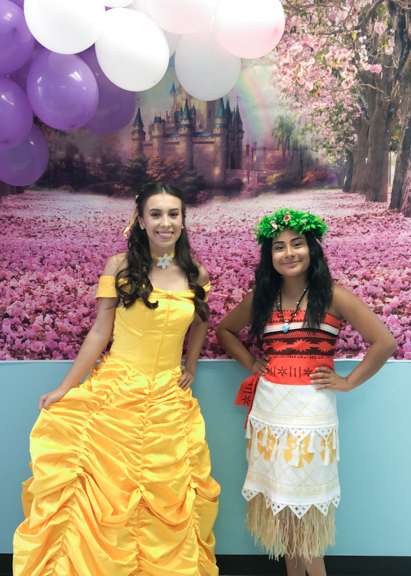 Moana and Belle greeted all the kids as they enjoyed their tea. The princesses took lots of pictures with their little princesses. 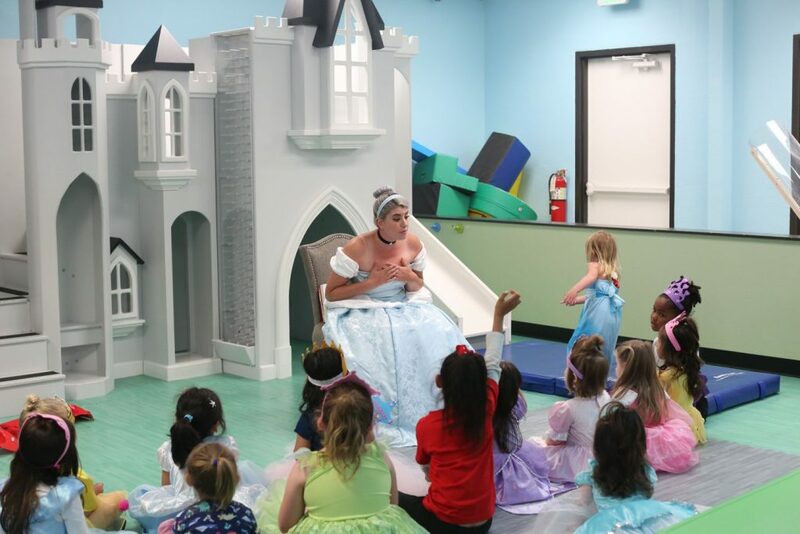 After tea time, all the little princesses enjoyed story time, a sing-a-long and they learned two princesses dances. 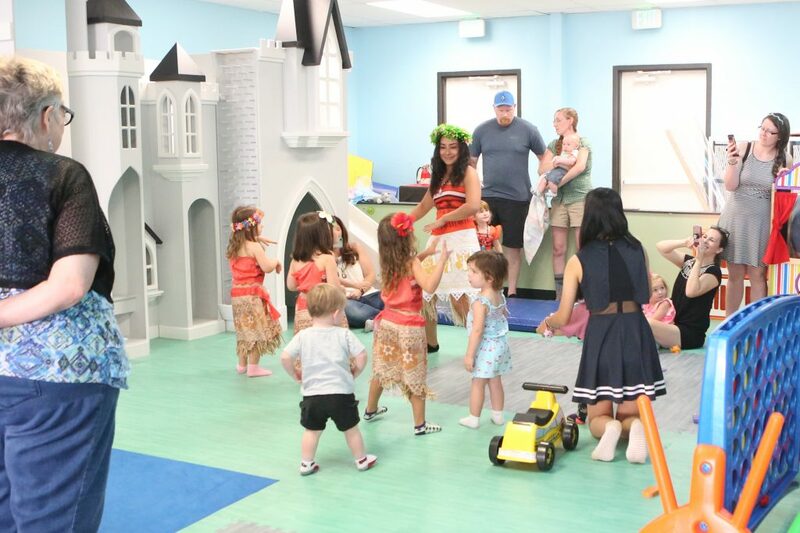 We love watching the kids do the hula and royal dance! Watch the video from this tea party here. 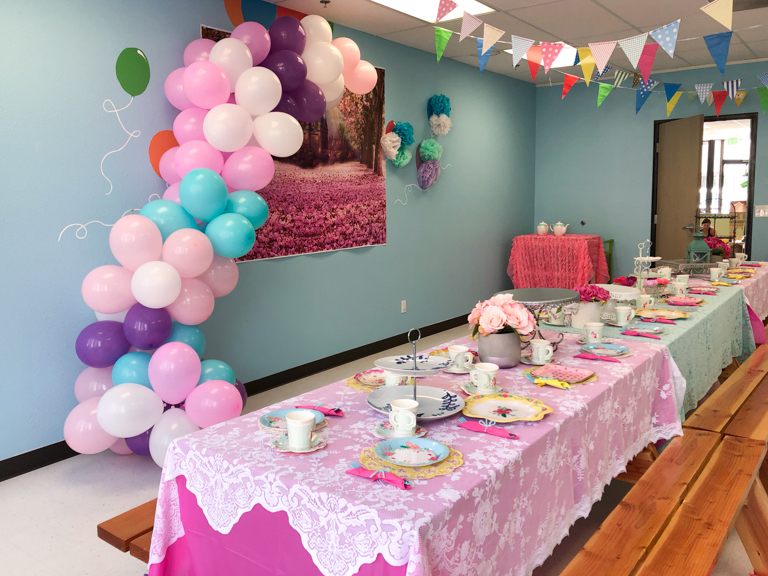 To see more detailed images of our tea party set up check out the blog from our last princess party. The sea calls us at our recent Moana Luau. Our special events have been called one big party. We believe that to be true and this one was extra special because Moana is well loved! 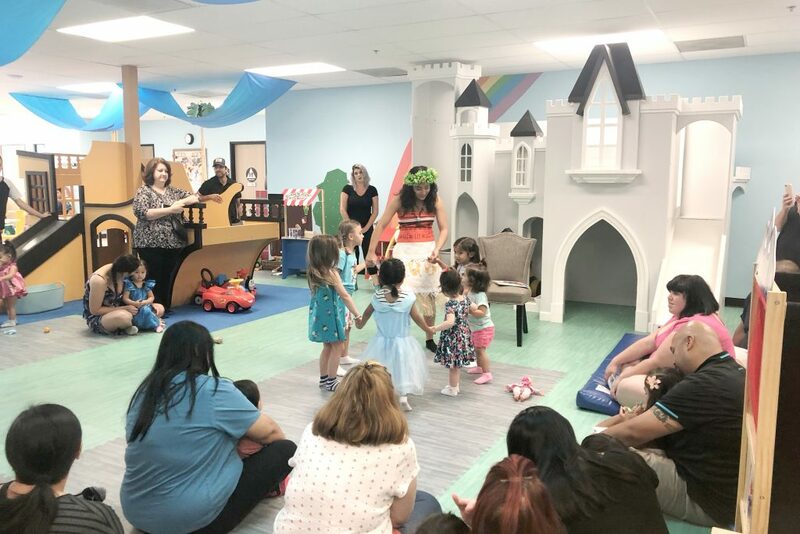 At this event our Moana read a Moana story and did a sing-a-long from the movie. She even taught the kids a little Hula! 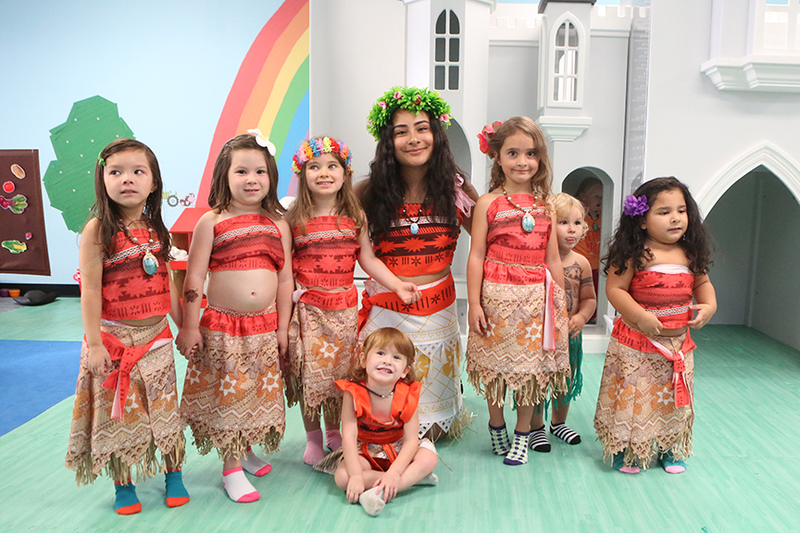 Our little Moana’s looked so cute dancing the Hula. After the kids got their very own tattoo by Moana. 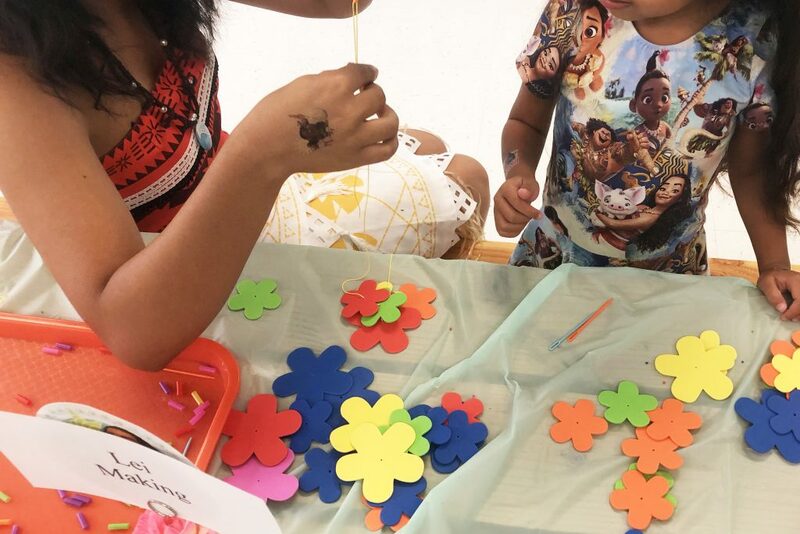 We did tons of Luau inspired activities such as sand sensory, frame decorating, flower crowns and lei making. 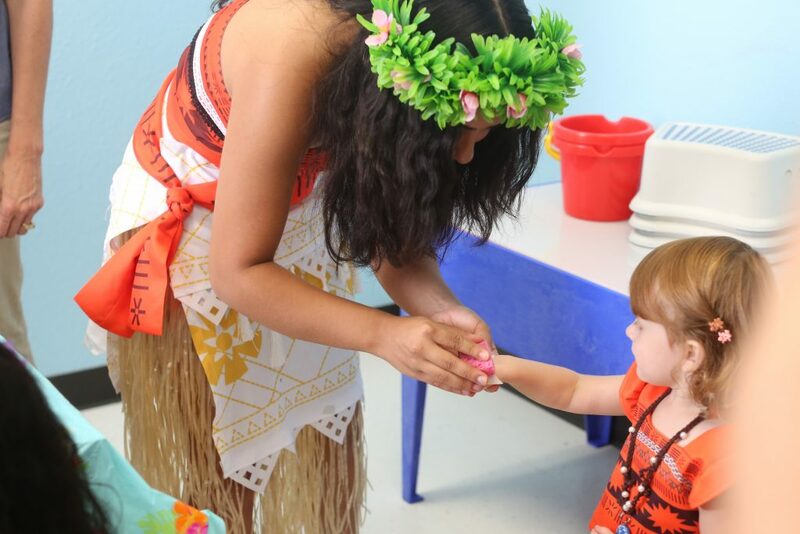 We’re so happy all our little Moana’s were able to come and enjoy Moana Luau with us. ….but we’re especially in love with our one baby Maui! Just too adorable! You can sign up for other special events on our online store. Also, check out the video. 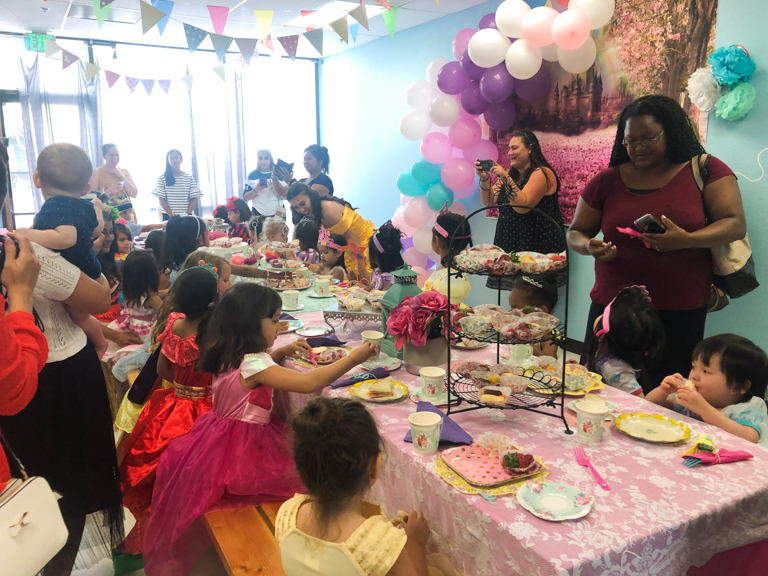 We had a princess party and it was awesome. 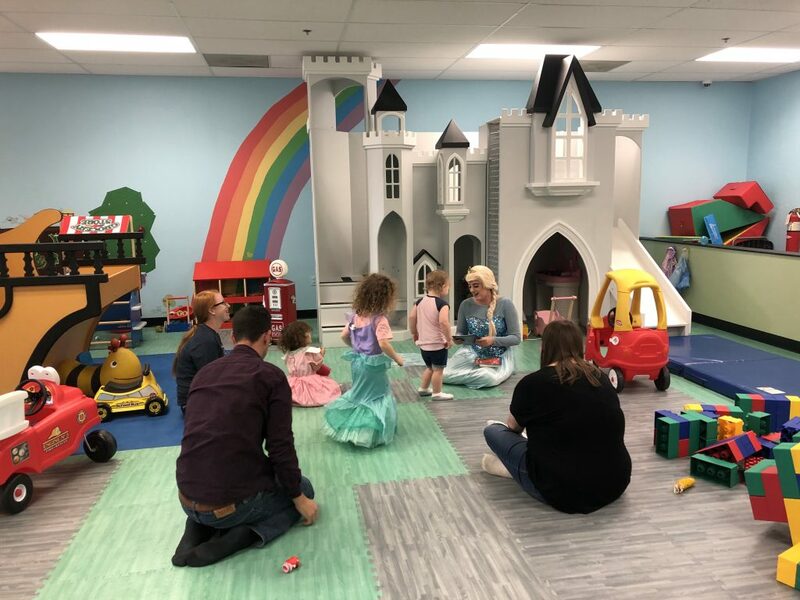 Cinderella had a wonderful time interacting with her Royal court in May and we had a such a fun time planning and decorating for this event. 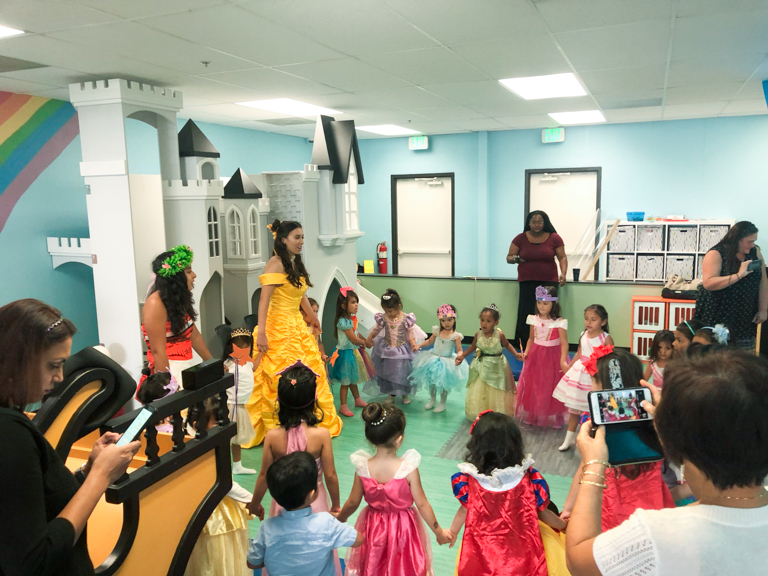 Check out all the details and use it for your princess party or book a themed party at Imagine Play and let us decorate a Princess Party for your Royal court. 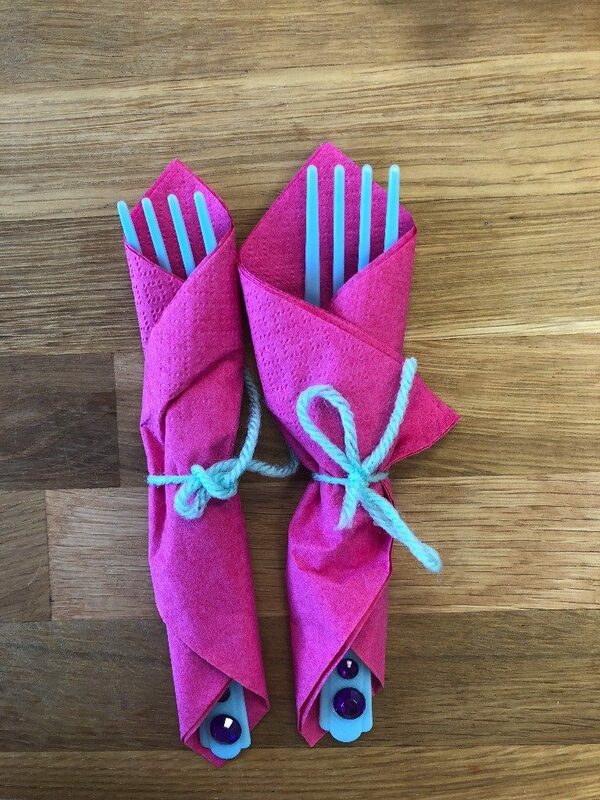 A simple idea to dress up your silverware. 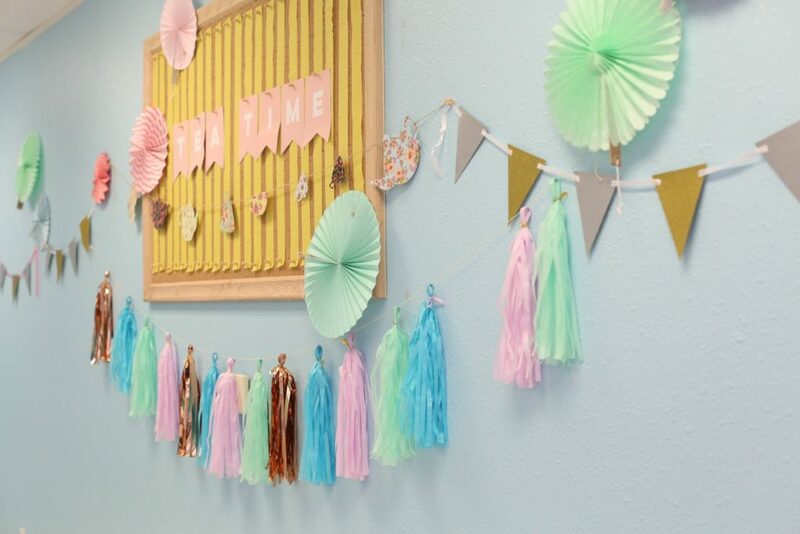 We bought pre-adhesive jewels at the craft store and it made this little idea easy to do! 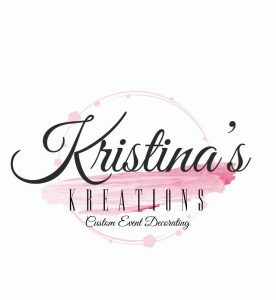 Using plastic table coverings as our colorful base, we added some additional interest to our tables by using a lace overlay. You can buy it by the yard at a local fabric store. In this case, the middle is fabric by the yard and the two on the end are lace curtains. 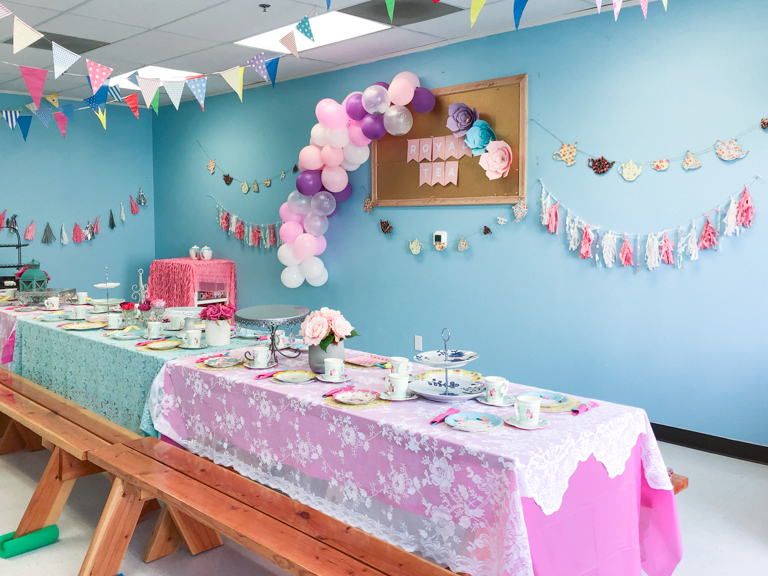 This particular party was Tea Party themed. 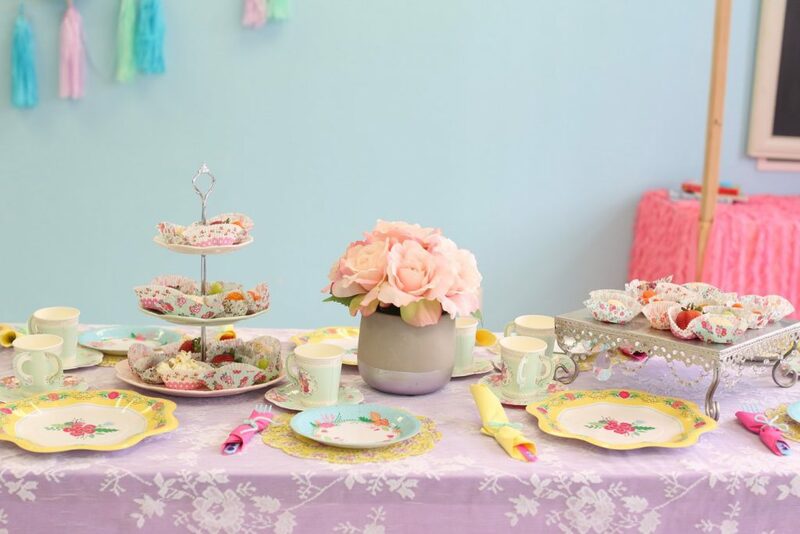 One of the things we love about a tea party is all the floral accents. 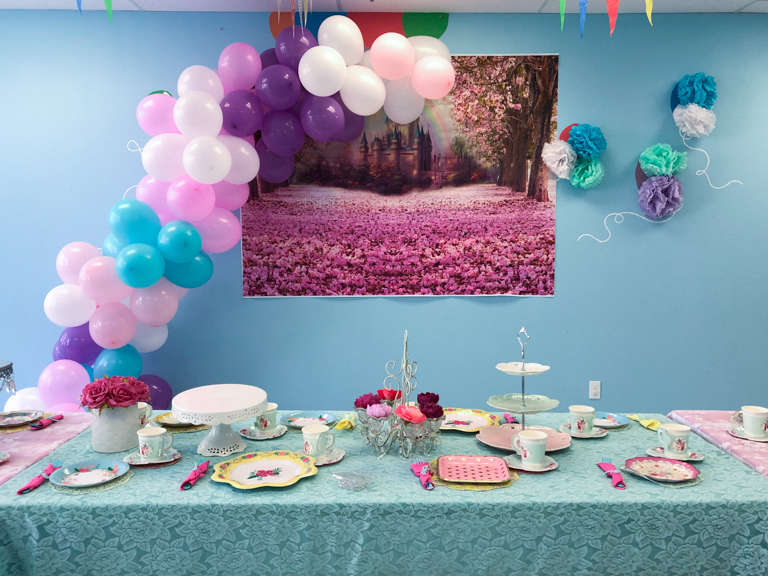 Check out this floral tea pot garland! So cute! You can buy those off of amazon. Of course, the tablescape was our favorite part. 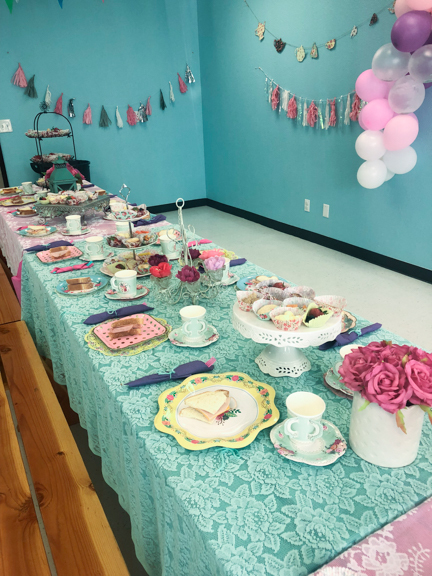 We bought decorative paper plates, dollies and tea party cups which accented the lace table really well. Whose favorite store is also Home Goods? These roses are from Home Goods and while they are not real flowers, they really are a sweet touch, nonetheless. Many of the table decor we already owned, but you can buy many of these decorative food displays at, you guessed it, also Home Goods. For food, we decided to serve snack size items in floral cupcake containers. 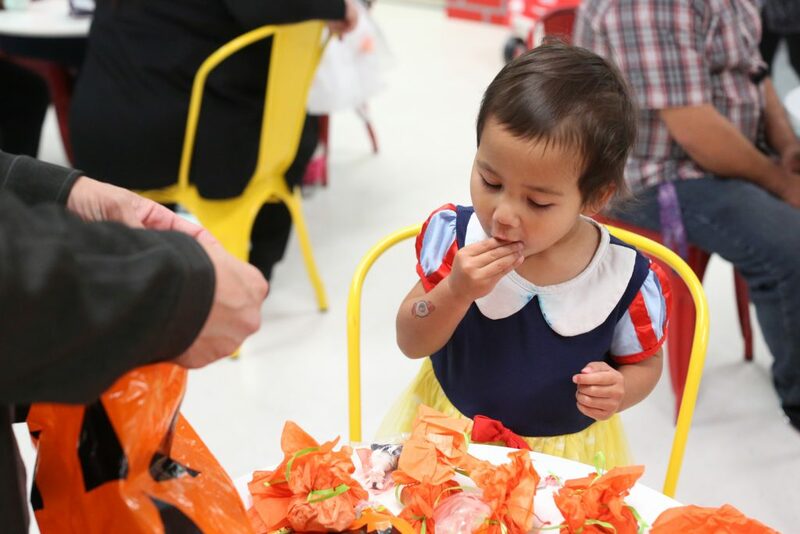 It was easy for our toddlers to grab what they wanted to eat, without the mess!